Graston is a respected form of instrument-assisted soft tissue mobilization used to effectively treat pain and restricted mobility. 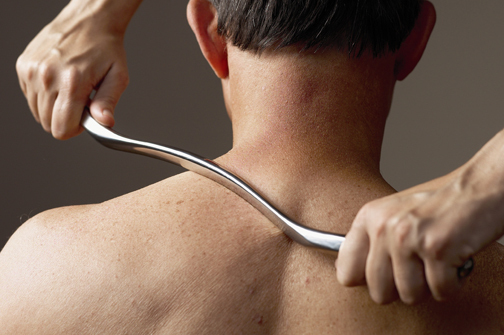 Therapists specially trained in the Graston techniques utilize uniquely designed stainless steel instruments to break down fascial restrictions and scar tissue that impair normal movement. What types of patients are treated with Graston? The internet has pictures of people horribly bruised following Graston techniques, but this is not the norm. While Graston is used for professional and Olympic athletes who may tolerate that type of extremely deep work, most people treated in our physical therapy clinic can anticipate a much less severe response. Typically we warm up the tissues so that they are less tender and more responsive to lengthening. Hands on techniques may be used in conjunction with Graston instruments to lengthen the injured tissue and allow for more normal movement patterns and reduced pain. There may be reddening of the skin, tenderness, and some light bruising depending on the individual and depth of pressure used. It is always done to the patients’ tolerance and with their consent. Exercise and ice are often included as part of treatment following Graston techniques. Click here for a printable information sheet on Graston technique. If you are interested in reading available research articles, please visit www.grastontechnique.com for more information.